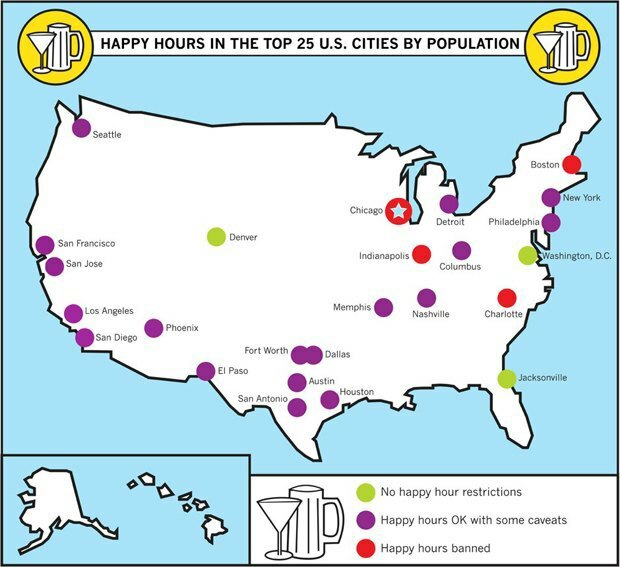 Happy hour might seem like a civil right, but in some towns, its only an urban legend. In the entire state of Illinois, happy hour is forbidden. Folks in Charlotte, North Carolina, Indianapolis, Indiana, and Boston, Massachusetts are also forced to pay full price for booze in the late afternoon. Different cities have different laws about discounted alcohol, so in case you were planning to cross state boarders for an after work drink, please consult the following map.